Home Sales Are Up but Will it Continue!? 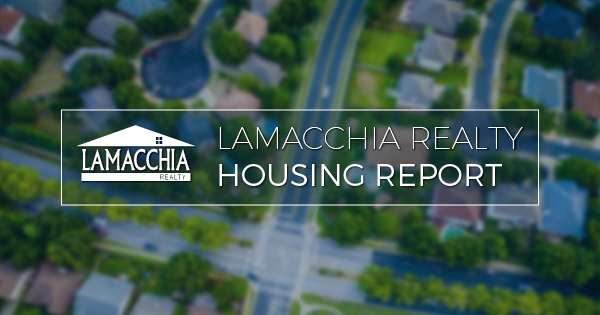 The Lamacchia Housing Report presents overall home sale statistics and highlights the average sale prices for single families, condominiums, and multi-family homes in Massachusetts and Southern New Hampshire for July 2018 compared to July 2017. It also looks at other metrics in Massachusetts like Homes Listed For Sale and Homes Pending, as they are often the best indicators for predicting future trends in the market. 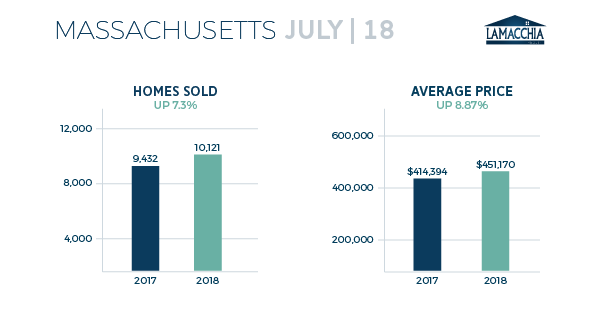 No decreases this month in Massachusetts as home sales increased in July 2018 from July 2017 by 7.3% in all three categories. Multi-families increased by the largest percentage, at 17.44% over last year with 882 this year compared to 751 last. Single families increased in sales by 6.89% from July 2017. 6,280 were sold in July 2017, compared to 6,713 this year. Condos increased by 5.21% with 2,401 last July rising to 2,526 in 2018. Overall, prices increased by 8.87%, from $414,394 in July 2017 to $451,170. Multi-families increased again by the largest percentage of 13.12%, with prices coming in at $478,429 from $422,933 last July. Single families increased by 6.92%, up to $498,035 from $465,812; condos increased by 9.14%, now up to $365,207 from $334,611. In the month of July, there were 882 price changes, when sellers reduced their list price, down 24.3% from June when there were 1,165. In July 2017 9,076 homes were listed for sale in Massachusetts compared to 9,635 in 2018, showing 6.16% increase. The market is more in the buyers favor than it has been all year- as supply is more able to keep up with the demand for homes. This further solidifies the notion that late summer and fall is the best time to buy a home. There were 8,728 homes that went pending in July 2017 and 9,192 in July 2018 showing a 5.32% increase. The number of pending home sales being up this month suggests that home sales will be up again next month. 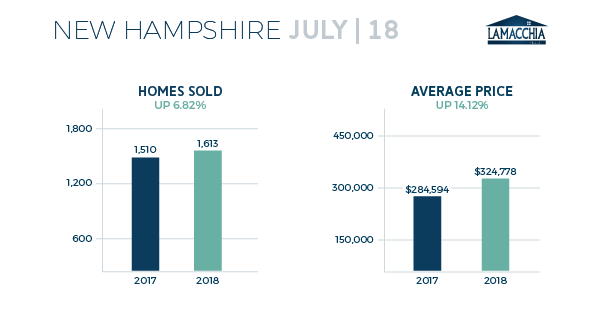 The number of properties sold in Southern New Hampshire increased overall by 6.82% from 1,510 to 1,613, with increases in all three categories. Multi-families increased by the highest percentage, 62.75% moving from 51 sold in 2017 to 83 sold this July. Condos followed with an increase of 16.71% with sales moving from 353 in July 2017 to 412 this year. Single families saw an increase of 1.08% bringing sales to 1,118 this year compared to 1,106 last year. The average price for homes in New Hampshire increased by 14.12%. Multi families saw the largest increase of 21.36% going from $247,249 in July 2017 to $300,051 last year. Single family prices increased 15.26%, now at $358,851 from $311,340, and condos increased by 8.65% from $250,365 last year to $272,019 this year. July was a very strong month for the housing market both with homes sold and homes pending being up. This overly active month of July was a result of the year having a bit of a late start due to the excessively low inventory that kept many buyers and sellers on the sidelines in early spring. Since then the market seems to have a bit of a change in the air. In early July several media outlets, starting with the Wall Street Journal, reported that the market was changed, and not just because of seasonality, but a real change. Anthony filmed a market update video in late July talking about these articles and stating that he thought it was a typical seasonal change. However, since then Anthony’s opinion has begun to change. What seems to have started on the West Coast seems to have made its way to the east by August. One clear sign of a real change is that inventory of homes for sale in Massachusetts in August has been higher than August of 2017. This is the first time there has been an increase in inventory year over year in four years. This is very good news for buyers and even for Want-to-Be or Worried Sellers who are scared to list because they don’t know where they will go. The next 90 days is the best time of the year to buy a home and that is especially true this year where inventory is higher than the year prior. We will be writing about this much more in the weeks to come so stay tuned. Sellers do have to keep in mind that pricing aggressively will get more eyes on the home and likely an offer faster than if the home is listed high. We saw that prices changes have decreased over the past month, by a little over 24%, but the need is still there as buyers have more homes to choose from and can negotiate on pricing more. Buyers need to remember not to only consider brand new listings, and that just because a home has been on the market for a little while doesn’t mean that there’s necessarily something wrong with the home. The only thing that could be wrong is that it just wasn’t priced right in the first place.